Having plunged to an 11-year seasonal low in September, the number of single-family homes and condos that traded hands across the greater Bay Area totaled 7,158 in October, up 19.8 percent on a month-over-month basis but 6.5 percent lower versus the same time last year and a mere 7-year seasonal low, according to recorded sales data from CoreLogic. 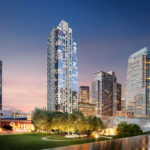 In San Francisco, recorded sales totaled 563 last month, representing an above average 56.4 percent seasonal jump from September and down a nominal 0.7 percent versus the same time last year, which was a four-year low, while inventory levels remain at a 7-year high and pending sales are down. Across the bay, homes sales totaled 1,531 in Alameda County, down 10.7 percent on a year-over-year basis, sales in Contra Costa County totaled 1383, down 10.8 percent, and sales in Solano County totaled 509, down 19.3 percent versus the same time last year. Home sales in Santa Clara County (1,515) were down 8.7 percent on a year-over-year basis in October while sales in San Mateo (613) were down 6.6 percent. And up north, home sales in Napa (128) were 26.7 percent higher versus the same time last year, sales in Sonoma (612) were 21,7 percent higher, and sales in Marin (304) were 10.5 percent higher than at the same time last year. 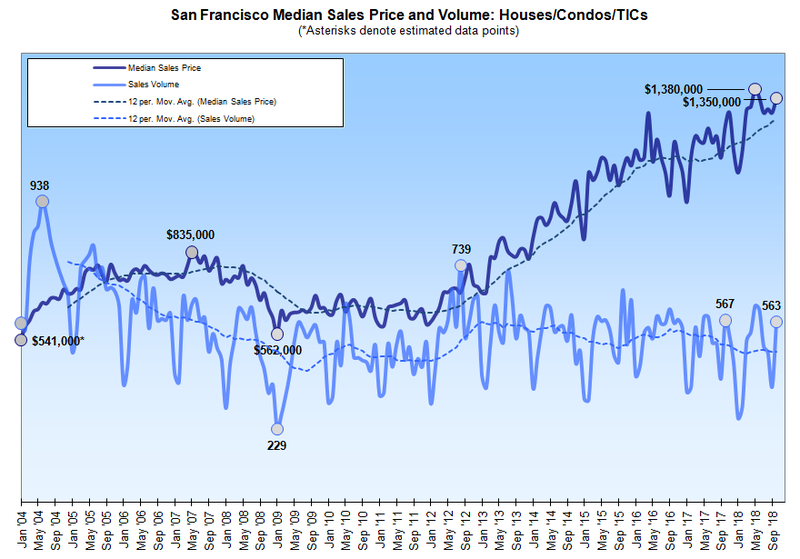 The median price paid for those aforementioned 563 homes in San Francisco was $1,350,000 in October, which was 2.2 percent below the record $1,380,000 set in May but 7.6 percent higher than at the same time last year. The median sale price in Alameda County slipped 0.6 percent to $825,000 last month but remains 6.5 percent higher on a year-over-year basis; the median sale price in Contra Costa County ticked up 1.7 percent to $610,000, which is 5.2 percent higher, year-over-year; and the median sale price in Solano County slipped 1.2 percent to $425,000 but remains 4.9 percent higher versus the same time last year. The median sale price in Santa Clara County increased 5.2 percent last month to $1,105,000, which is 13.6 percent above its mark at the same time last year, while the median sale price in San Mateo County increased to $1,329,250, which is 8.0 percent higher, year-over-year. The median sale price up in Marin jumped 9.8 percent to $1,150,000 last month, which is 17.9 percent above its mark at the same time last year. The median in Napa dropped 4.4 percent to $605,000 but remains 2.5 percent higher on a year-over-year basis. And the median sale price in Sonoma dropped 3.2 percent to $590,000, which is 0.9 percent higher versus the same time last year. And as such, the median home sale price across the greater Bay Area increased 3.7 percent in October to $845,500 and remains 9.3 percent above its mark at the same time last year. Keep in mind that while movements in the median sale price are a great measure of what’s selling, they’re not necessarily a great measure of appreciation or changes in value and are susceptible to changes in mix, as opposed to movements in the Case-Shiller Index. All I know is I walked Noe Valley and all those realty offices had squat for sale. Went to the Baltic Fair at 425 Hoffman, which is tres charmont! 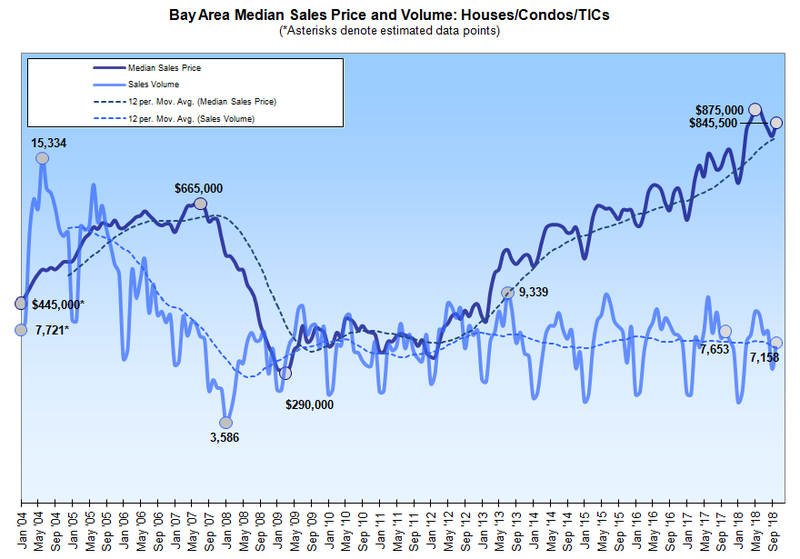 Median selling price up 9.3% across Bay Area, not a strong signal to indicate a plunging market. That median REALLY shot up in 07. But all these same signals were present: building inventory, apples to apples selling lower than they were purchased for or the same as they were purchased for years earlier. What happened then was that people were getting no doc loans, interest only loans, etc., that had pushed prices up. When interest rates strode higher in 2006, people ran out of cash to service the mortgages. For a while, people just refinanced and used the cash out to pay the mortgage, but a lot of people just started selling, figuring the trend was only heading down, and using a mortgage to pay a mortgage would only last so long, and then prices would be lower. What I suspect is happening here is that people took out ARMs just to get in the house, and that pushed prices up. Now that interest rates are rising, potential buyers are afraid of ARMS and won’t take them out, and if they won’t take them out, they won’t qualify at these prices. Meanwhile the ARMS from 2012-2013 are resetting and the people who took them out in 2014-2015 see the handwriting on the wall, and the sellers are getting desperate. Interest rates might fall, but only in a recession, so either way, prices will fall. Sure, not everyone is in this situation, but the pricing happens at the margins, and its heading down, and probably for a while. But look at that graph. Did the median rise in 2007? Not a good leading indicator. Median price moving average was flat to down in 07. Are there any places to see the stats on ARMs? I suspect the new disclosure requirements have soured buyers on them. Why would sellers be desperate if prices are still rising? The median price has risen through the last 5 years so the buyers can refi on the boosted equity. I think there’s a lot of extrapolation going on here while ignoring the clear signal on price. This is exactly the wrong way to use median price. If you and your neighbor both buy similar houses for $1M and he goes to sell and finds that tastes have moved upmarket and so puts in $500k of expansions and upgrades only to have it sell for $1.4M, that increases the median price but does not indicate that your equity has been boosted. The change in valuation you get is what repeat sales (i.e. apples-to-apples) indices such as case shiller try and measure. If you bought an old Chevy in the 70’s and try and re-sell it in the age of luxury SUVs, even though the median car price is much higher that doesn’t indicate that you will receive that increase in value for your old Chevy. A car and real estate are pretty much the same, both are investments (“investment vehicle”) and a home built in the 70s is pretty much worth 0 just like a car of the same era. Your skill with analogies is only bested by your keen grasp of the difference between median and arithmetic mean. P.S. Case Shiller in SF is up over the same time frame. Back in the last 2007 cycle, the NAR fought bitterly for the median price and against looking at repeat sales. And if you think that they did this because of David Lereah’s sense of statistical aesthetics, then I have some Florida swampland to sell that might be right up your alley! But even they eventually capitulated. “NAR has been sharply critical of the repeat sales methodology for years – and now to suddenly create one because it works better? Damaging logic and once again undermining NAR’s credibility and branding. Lending standards are much more stringent today then in 2007. Today we have a president who thinks trade is bad and deficit spending in a strong economy is good. So completely different problems, but still problems. Zero percent increase in sales volume since late 2006. Population of Bay Area has increased about 6% since then. So number of home purchases per person/ family has decreased. Few people would say a property market where prices are such that only the 1% can get in the game is healthy. A couple of more years with these trends and we look like Paris did yesterday. People have been predicting that if current trends in U.S. inequality continue, social unrest will result since the early 1980’s and unless you count Occupy Wall Street seven years ago (I don’t), the trends do continue and the unrest keeps not happening. This time will be no different. The big difference between the U.S. and France is that in the U.S., the capitalist system has pretty much perfected panem et circenses as tools for de facto social control.